Perched high atop Tombstone Ridge, along Trail Ridge, two wind sculpted frames of Limber Pines are testement to the difficult exsistence of life in an alpine habitat. The winds that helped sculpt these Krummholz tree's made photography difficult but a beautiful sunrise unfolded as the clouds above took on the pink hue of the mornings first light. 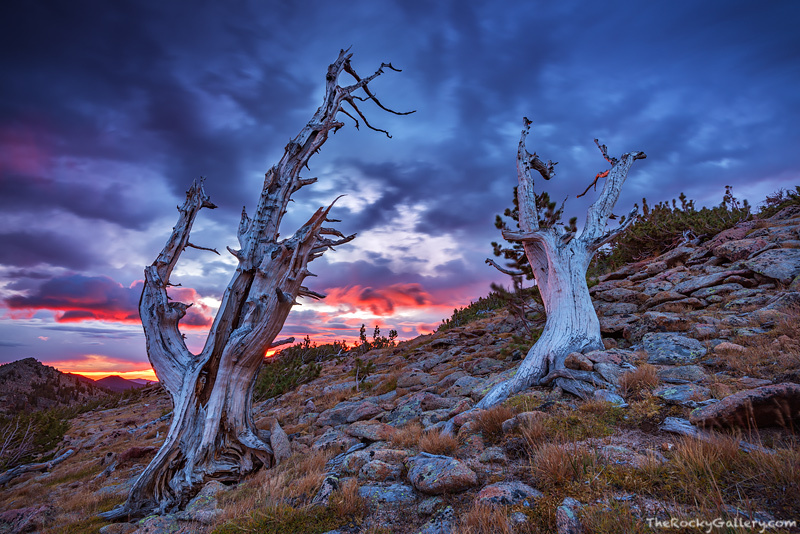 Much of Rocky Mountain National Park is located above 11,000 ft, and visitors who venture into the sub alpine zone will find these Limber Pines or Krummholz twisted and contorted from the high winds and weather. These tree's make for amazing photographic subjects as no two are ever alike. Photo © copyright by Thomas Mangan.